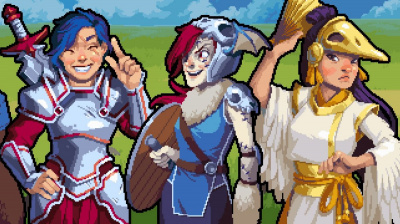 Commanders are the most powerful unit type in Wargroove. They are the leaders of each army, and generally the only characters which speak with one another throughout the story. Most maps limit the player to a single commander, and they cannot be recruited using buildings. Although they are the most powerful unit class, in many cases winning a match depends on their survival. On a number of maps, the player will lose the match if their commander is lost. Each commander also has a unique musical theme. Each faction has at least three unique commanders available. These commanders will always accompany units which are part of their faction. Battle sprites of the first nine commanders to be revealed. Each commander can use a special move called a groove. Each groove is unique to the commander, with entirely different effects between them. Whereas the commander Mercia can use her groove to heal adjacent units, Valder can use his groove to conjure an entirely separate unit. A commander can only use his or her groove when their groove meter is filled to 100%, and using it depletes the meter to 0%. The meter fills under varying different conditions, including dealing and taking damage. ↑ 2.0 2.1 ChuckleFishLive, Wargroove Scenario Editor, Twitch (video), published 11 October 2017, retrieved 25 January 2018. This page was last modified on 10 April 2019, at 22:28.